Credit: Artur Szczybylo (Shutterstock) By Rhonda Scharf Do you love your job because you're good at it, or are you good at your job because you love it? I love what I do. I love it, and I'm good at it. I'm not sure which came first (chicken/egg) but I'm fortunate to have both elements. But what if one of them were missing? What if you were good at something but didn't love doing it, or loved doing some- thing but weren't good at it? Here's how you can achieve that balance: not only being good at your job but loving it as well. Problem #1: Good at your job, but don't love it My technical skills are good. I'm skilled in Microsoft Office, comput- ers and generalized technology. But I don't love teaching those skills any more. I know a ton of apps and software programs, and I can use the programs well, but I don't love it when they're always changing things and I have to learn new ways of work- ing with them. Teaching people how to use technology took me from executive assistant to "Trainer Extraordinaire" back in the late 1980s. I helped people transition from whatever manual sys- tem they were using to an automated system. That was back in the days of WordStar and DOS. And not only was I good at it, I loved it at the time, too. However, for a variety of reasons, I stopped loving it. How do you get the love back? How do you re-energize yourself to become more enamored with the work tasks you're good at? 1. Manage your stress. One of the reasons I stopped teaching technology was because it caused a lot of stress in my life. I found that I kept running into "that student" who needed to prove that she was smarter than I was, asking all kinds of questions I didn't APRIL 2019 P R O F E S S I O N A L D E V E L O P M E N T F O R C A N A D A ' S O F F I C E S U P P O R T S T A F F Administrative Assistant's UPDATE UPDATE PM #40065782 INSIDE The EA's vital role . . . . . . . 2 Four key EA behaviours that help drive CEOs' performance Your LinkedIn image . . . . . 3 How to step out from behind your exec and highlight you! Conference strategies . . . . . 5 10 guidelines for maximizing your ambassadorial presence Dynamic PowerPoint . . . . . 6 How to embed YouTube video in your presentation Take a bow, admin pro! Wednesday, April 24, is Adminis- trative Professionals Day. Not to be pushed aside by oncoming artificial intelligence, admins have demonstrated their capacity to take on business-savvy roles that enable their executives to focus on high-level business goals and relationships, knowing that the day-to-day operations of their offices are effectively and sensi- tively managed by their business partner, the admin pro. So we take this opportunity to celebrate your perspicacity. We are delighted and grateful for the opportunity to be a journal for your accomplishments and profession- alism. 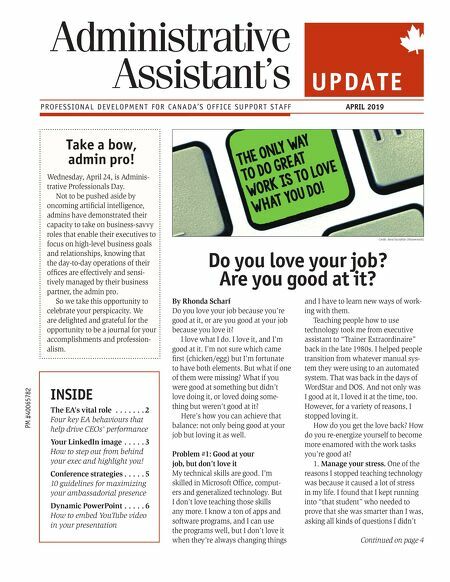 Continued on page 4 Do you love your job? Are you good at it?